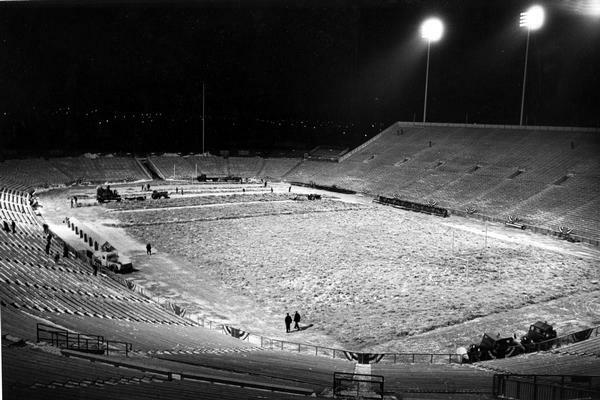 Workmen, shivering in the 6 a.m. predawn cold, remove hay from the field at Green Bay City Stadium (now Lambeau Field) before the NFL championship game between the Green Bay Packers and the New York Giants. The Packers went on to win the game 37-0. The hay, which formed a one-foot padding on top of the field tarpaulin, was used to protect the field and leave it green and dry for the game. The men are using Farmall tractors and implements to remove the hay. This image was printed in International Harvester World magazine (Feb. 1962, p. 22). Photo by Emery Kroening for International Harvester.